Next-level performance calls for clean, next-level protein. Build and repair strong muscles and reduce recovery time with help from Vega Sport Performance Protein. Featuring 30 grams of complete protein-made from premium plant-based ingredients, including pea, alfalfa, organic pumpkin seed and organic sunflower seed proteins-Vega Sport Performance Protein delivers a balanced, full-spectrum amino acid profile. Every delicious post-workout serving of Vega Sport Performance Protein powder boasts 6 grams of branched chain amino acids (BCAAs), 6 grams of glutamine, turmeric, tart cherry and probiotics. Enjoy Vega Sport Performance Protein within 45 minutes after your workout. Easy to make on-the-go shaken with ice-water or non-dairy milk, you can also add it as a protein supplement to your favorite smoothie recipe. Pea protein, Cocoa powder, Pumpkin seed protein, Organic sunflower seed protein, Alfalfa protein, Tart cherry, Probiotics (Bacillus coagulans [provides 1 billion cfu/serving]), Bromelain, Turmeric extract, Black Pepper extract, Beetroot powder (for colour), Sea salt, Natural Mocha flavours, Natural vanilla flavour, Natural chocolate flavour, Stevia extract, Xanthan gum. 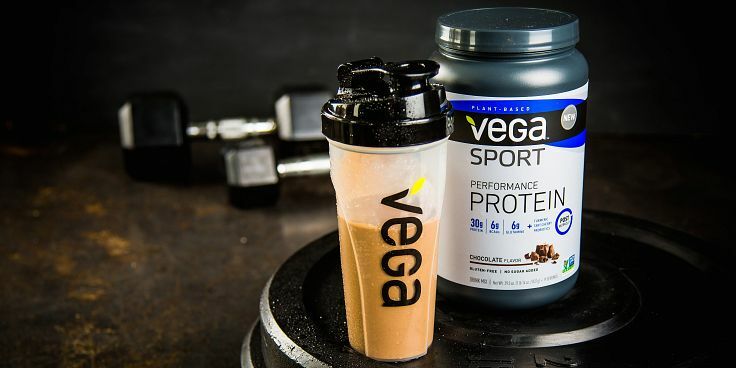 Help build and repair your muscles post-workout, and support recovery with Vega Sport Protein. Next-level performance calls for a next level protein shake.